The Rhodes facility is located in Kallithea, on a privately owned area of 16,500 square meters. The total storage capacity of the facility is approximately 7,900m3 and the daily distribution capacity through tanker trucks is over 200 m3 of fuels, over an 8-hour operation during the winter months and 600 m3 of fuels over the summer. There are 7 employees -under permanent and temp contracts- that work on-site. There are eleven (11) ground and aviation fuel tanks. Refueling takes place with tankers through a mooring pier and a system of three 6’’ subsea pipes, about 150 meters long, that connect the pier with the onshore facility, at a speed of 200m3/hour. The tankers that can be accommodated at the pier have a total tonnage of 3,500 DWT, with a stern unloading capacity. Tanker trucks loading takes place at three loading hubs, through fully automated bottom loading systems, at a speed of 120 m3/hour for up to 4 products simultaneously. The loading systems feature automatic additives injection set-ups during loading. The facility also has a Vapor Recovery Unit (VRU), a wastewater treatment plant, modern pumping station, and a fire extinction water tank, while it fully complies with the corporate health and safety regulations, and meets all environmental legislation requirements. 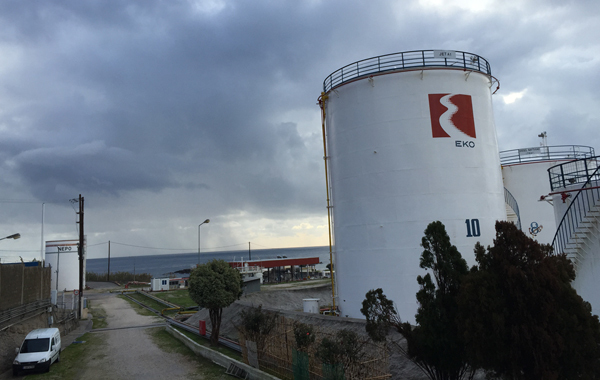 The Rhodes facility serves the ground fuel supply needs of Rhodes and the nearby islands (Kastelorizo) and supplies with aviation fuels the island’s airport.